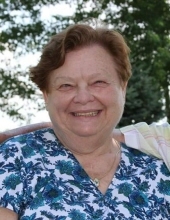 Joan Duis, age 79 of Canby, MN passed away peacefully on Saturday, February 9, 2019 at the Sanford Canby Medical Center surrounded by her family and friends. Mass of Christian Burial will be 10:30am on Friday, February 15th at St. Peters Catholic Church in Canby, MN. Visitation will be 5 to 7pm on Thursday, February 14th at the Houseman Funeral Home-Birk Chapel in Canby with a prayer service at 7pm and rosary to follow. Visitation will resume one hour prior to the service at the church. Burial will be held at a later date at the St. Peters Catholic Cemetery. Joan Cecelia Duis was born on March 31, 1939 to Gustaf and Emma (VanHyfte) VanOverbek on their family farm by Minneota, MN. She was born into a family of 11; five sisters and five brothers. She was baptized, had first communion and was confirmed at St. Edward’s Catholic Church in Minneota, MN. She was raised in the Minneota area. She attended St. Edwards Catholic School and Minneota Public School. After school, she went to Minneapolis as a nurse surgical tech for two years. On October 24, 1959, Joan married the love of her life Donald Duis. To this union they were blessed with 6 children, 3 boys and 3 girls. She was a devoted mother and farmed near Canby alongside her husband milking cows, raising chickens and raising six blessed children. Joan loved to sew, take care of her big garden and rose bed, canning, baking bread and was a proud member of CCW. In 1982 Joan went to work in Canby at Sioux Valley Hospital as a dietary technician for 25 years until retirement in 2007. Upon retirement she enjoyed many years at home with her husband and dealing with the struggles of congestive heart failure. Grateful for sharing and enjoying Joan’s life are her husband, Donald of 59 years; her five children: Joe Duis, Canby, MN, Julie (Kevin) Giuliano, Troy, NY, Jean (Dan) Wollum Canby, MN, Mary (Tom) Fleischhacker, Brainerd, MN; Greg (Jackie) Duis, Canby, MN, daughter-in-law, Carla Duis, Hendricks, MN; 19 grandchildren: Derek (Nicole), Nicholas (Antonia) and Corey; Cody (Sarah), Lynn, Jon (Maeghan), Nichole (Michael), Jason (Stephanie), Alexis and Elysa; Charissa (David), Chaylee, Jordan, Joshua; Katie, Cindi and Tyler; Johnathon and Alison; 19 great- grandchildren; brothers: Renil and Odell; sisters: Kathy and Jeanette; and numerous nieces, nephews, cousins and friends. She was preceded in death by her parents, Gustaf and Emma VanOverbeke; her son, James; brothers: Al, Tony and Lawrence; sisters: Gen, Dorothy and Evelyn. Blessed be her wonderful memory. To plant a tree in memory of Joan Cecelia Duis, please visit our Tribute Store. Visitation will be 5 to 7pm on Thursday, February 14th at the Houseman Funeral Home-Birk Chapel in Canby with a prayer service at 7pm and rosary to follow. Visitation will resume one hour prior to the service at the church. "Email Address" would like to share the life celebration of Joan Cecelia Duis. Click on the "link" to go to share a favorite memory or leave a condolence message for the family.